Wishing someone a “Happy Birthday” on Facebook is probably one of the most mundane and unoriginal things we do on the network. Whenever it is someone’s birthday you tend to get an almost endless stream of the exact same thing or slight variations of the same thing. It is basically the least human way to interact with someone on their birthday aside from saying nothing at all. 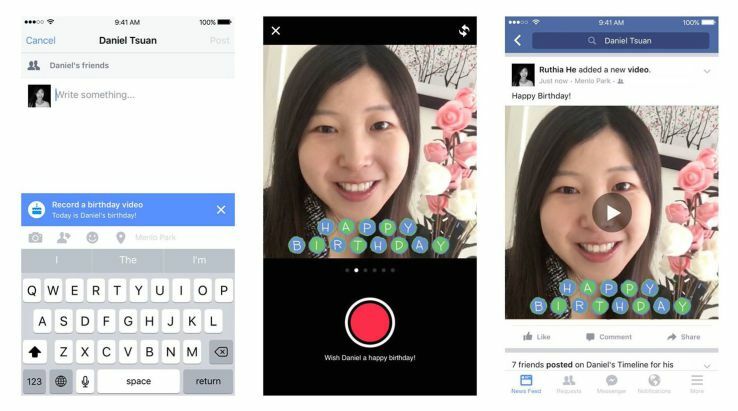 Facebook is now pushing a newly launched Birthday Cam feature on iOS. A banner on the birthday boy or girl’s profile will now encourage you to capture a 15 second video instead of typing a message on their wall. So now even if you are simply saying “happy birthday” in the video clip, it will at least be a lot more unique than just typing it. Over the past number of years Facebook has developed some strange behaviours among us all. From pity liking which is where we like a status not because we actually like it but because you can tell the person tried hard to write it and expects us to like it, to inviting friends to events who live hundreds of miles away and we may have not seen in years but we don’t want to run the risk of them feeling left out. “Happy Birthday” wall posts are without a doubt the most common Facebook behaviour of them all. Since the early days of Facebook we have always been given a heads up on a friend’s birthday which in turn spawned the practice of writing something on that person’s wall. Of course we now all write the same unoriginal thing on everyones wall every time a birthday comes up. Typically we see a generic “Happy Birthday” and then some people will put a bit more effort into it and add a, “hope you have a great day!” onto the end of that. It is always nice to skim through birthday posts when your day is arrive, or many of us are like my dear mother and like to count the posts as they come in so that we know our social life is still existent and people still do care. The new Birthday Cam will look to shake things up a little bit and give you the opportunity to post something different onto someone’s wall for their birthday. It could even make scrolling through your wall more enjoyable when your birthday comes around!